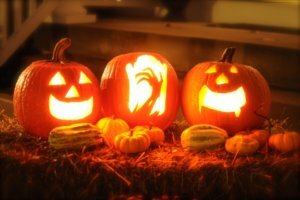 Home : Blog : Current Events : What to do with a Leftover Jack O’ Lantern? What to do with a Leftover Jack O’ Lantern? Seeds: If you haven’t already toasted pumpkin seeds for a human snack, you can let pumpkin seeds dry and set them out for birds (no salt, please!). Bird Feeder: Hang your pumpkin from a tree! Find two sticks, and stick them through the jack o’lantern, then fill it with birdseed, and hang from a tree with twine tied to the sticks. The birds will enjoy perching on the pumpkin while they eat. Set out for Wildlife: Baby Fiona at the Cincinnati Zoo isn’t the only animal who likes eating pumpkins https://www.youtube.com/watch?v=TmvJQnqa96I&t=76s. Deer, squirrels, and rabbits all like this tasty snack, and will appreciate you leaving your Halloween gourds out for them. It’s a good idea to break up the pumpkin into pieces, and to set them near treelines, if possible. Keep an eye out, especially early in the morning, to see if you have any visitors to your leftover pumpkins! Note – Do not use painted pumpkins for these activities, as the paint may be toxic to animals. Just stick with the carved ones!